The first day of qualifying for the US Open Junior Championships was not completed Friday at Cary Leeds Tennis in the Bronx, with light rain causing delays in the afternoon. Only 21 of the 32 matches on the schedule were completed, and winners of the 11 postponed first round matches will need to play again Saturday afternoon. [NOTE: Second round matches for those who did not play Friday were not played Saturday, but held over to Sunday]. This may delay the release of the draw Saturday evening, which is usually not done until all the qualifying is complete. Chloe Beck, Savannah Broadus, Reese Brantmeier, Axel Nefve and Alex Bernard are the Americans who did not get to play their first round matches Friday. Of the 11 Americans who did play Friday, four won their first round matches. Emma Jackson, who received a wild card when Broadus moved into the qualifying at the last minute, beat No. 16 seed Joanne Zuger of Switzerland 6-3, 4-6, 7-5, after serving for the match at 5-1 in the third. Jackson will play top seed Hong Yi Cody Wong of Hong Kong for a place in the main draw. Hurricane Tyra Black, the No. 2 seed, defeated Martina Biagianti of Italy 6-4, 6-4. US girls losing their first round matches were Kacie Harvey and wild cards Alexandra Yepifanova, Robin Montgomery and Katrina Scott. The two US boys picking up victories were wild card Alex Lee and No. 15 seed Eliot Spizzirri. Lee defeated No. 13 seed Davide Tortora of Italy 6-1, 7-5, while Spizzirri, down 5-3 when rain delayed the match, came back to defeat wild card Hikaru Shiraishi of Japan 7-6(2), 6-4. The US boys losing in the first round today were Ronan Jachuck and wild cards Niroop Vallabhaneni and Eric Hahn. I'll be heading out to the junior qualifying on Saturday, so check out my twitter updates from there. There is live scoring available at the US Open website. John Isner, Serena Williams and Sloane Stephens advanced to the fourth round with wins today. Sonya Kenin and Karolina Pliskova of the Czech Republic were still playing as of 11 p.m. Friday night. The finals are set at the Grade 1 in Repentigny Canada, with both No. 1 seeds reaching the championship match. Clara Tauson of Denmark will face No. 8 seed Victoriia Dema of Ukraine and Hugo Gaston of France will play No. 14 seed Rinky Hijikata of Australia. Hijikata ended the run of unseeded American Emilio Nava 6-3, 6-2. In the all-French boys doubles final, top seeds Gaston and Clement Tabur defeated unseeded Arthur Cazaux and Harold Mayot 7-5, 6-2. Margaryta Bilokin of Ukraine and Naho Sato of Japan, the No. 2 seeds, defeated top seeds Tauson and Italy's Elisabetta Cocciaretto 6-2, 4-6, 10-4. Qualifying for the US Open Junior Championships begins Friday, and for the first time in my 15 years covering the tournament, it will not be outside the National Tennis Center in Flushing Meadows Queens. This year the junior qualifying will take place at the Cary Leeds Center in the Bronx, with players taking buses to the site from the Grand Hyatt in Manhattan. The qualifying fields of 32 players have nine US girls and seven US boys, who will need to win two matches to advance to the main draw, which begins Sunday at the Billie Jean King National Tennis Center. Those who received entry based on their rankings are Hurricane Tyra Black, Chloe Beck, Kacie Harvey and Savannah Broadus. Broadus had originally been given a wild card, but she did not need it; it went to Emma Jackson instead. The other US girls receiving wild cards are Alexandra Yepifanova, Robin Montgomery, Katrina Scott and Reese Brantmeier. The US boys receiving wild cards are Alexander Bernard, Eric Hahn, Alex Lee, Niroop Vallabhaneni and Axel Nefve. No. 15 seed Eliot Spizzirri, initially listed as a wild card recipient, got in on his own, as did Ronan Jachuck. 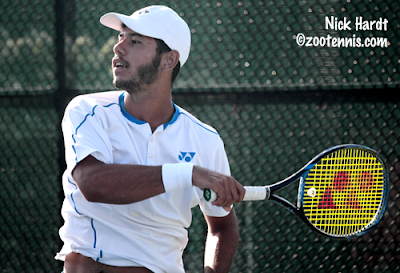 The USTA had reserved a wild card for Emilio Nava, who was one out of the main draw, but after he reached the semifinals at the Grade 1 in Canada today, he received a special exemption into the main draw, freeing up that wild card, which was given to Zane Khan. The USTA had reserved a girls main draw wild card, which has been awarded to Connie Ma. Nava, who defeated No. 7 seed Clement Tabur of France 5-7, 6-1, 6-3 today at the Grade 1 in Repentigny, will play No. 14 seed Rinky Hijikata of Australia in Friday's semifinals. Top seed Hugo Gaston of France will face unseeded Taisei Ichikawa of Japan in the other semifinal, with Ichikawa also likely to have received a special exemption in to the main draw, as he was entered in qualifying. The girls semifinals are top seed Clara Tauson of Denmark against No. 4 seed Clara Burel of France and No. 5 seed Elisabetta Cocciaretto of Italy against No. 8 seed Viktoriia Dema of Ukraine. Only one American, No. 14 seed Madison Keys, was able to pick up a second round win in singles, and hers came at the expense of fellow American Bernarda Pera. Taylor Townsend and qualifier Francesca Di Lorenzo both fell to seeded players; Frances Tiafoe was beaten by Alex de Minaur of Australia and Tennys Sandgren lost to Novak Djokovic on Arthur Ashe Stadium tonight. NCAA doubles champions Martin Redlicki and Evan Zhu lost 6-4, 6-4 to Divij Sharan of India and Artem Sitak of New Zealand. Coco Gauff, who dropped from the No. 1 spot in the ITF Junior rankings this week, but will be the top seed at the US Open Junior Championships, received a mixed doubles wild card with Chris Eubanks. The pair surprised No. 3 seeds Henri Kontinen of Finland and Hao-Ching Chan of Taiwan 6-4, 6-4 in first round action today. 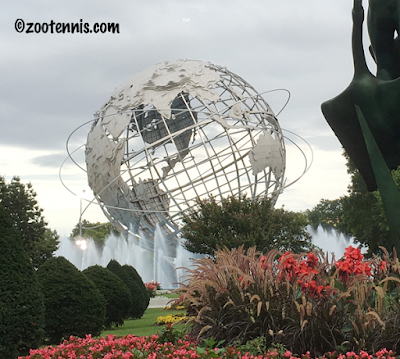 My review of last week's ITF Grade 1 Prince George's County International Hard Court Championships is available today at the Tennis Recruiting Network. The girls final between Katie Volynets and Hurricane Tyra Black was a dramatic one, which made up for the retirement by Nick Hardt in the first set of the boys final. Gilbert Soares Klier Junior of Brazil, who won the boys title, expressed doubt about playing the ITF Grade 1 in Canada when I talked to him after the match, and although he did make the trip to Repentigny, he retired in his first match. Speaking of Repentigny, Emilio Nava won his match today, beating Jacob Fearnley of Great Britain 6-3, 6-4 to advance to the quarterfinals. Videos of the champions are below, with videos of the finalists Black and Hardt available by clicking on their names. A photo gallery with 30 of the tournament's competitors can be found here. Another hot day at the US Open ended with four American women and two American men advancing to the third round. Taylor Fritz made the third round of a slam for the first time when wild card Jason Kubler of Australia retired, down 6-3, 3-6, 6-3, after turning his ankle. Fritz will face No. 9 seed Dominic Thiem of Austria on Friday, after Thiem came back to defeat Steve Johnson 6-7(5), 6-3, 5-7, 6-4, 6-1. John Isner was taken to five sets and spent more than three and a half hours on court, but did reach the US Open third round for the tenth straight year, coming back to beat Nicolas Jarry of Chile 6-7(7), 6-4, 3-6, 7-6(2), 6-4. Sloane Stephens was tested by qualifier and 2014 US Open girls finalist Anhelina Kalinina of Ukraine but the defending champion came through with a 4-6, 7-5, 6-2 win. The Williams sisters are set to meet for the 30th time Friday after both won their matches in straight sets today. Sonya Kenin closed out the night for US players by coming back to beat No. 32 seed Maria Sakkari of Greece 4-6, 6-1, 6-2. The 19-year-old, who reached the third round of the US Open last year, started slowly, going down 3-0, got back on serve, but was broken to end the set. 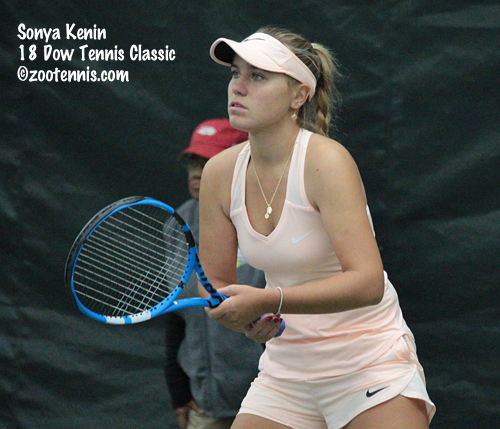 Kenin, the 2015 USTA National 18s champion, played flawlessly in second set, making just three unforced errors, and although she let a 4-1 lead slip away in the third set, Kenin was able to save two break points serving at 4-all, then broke Sakkari to win the match. She will face No. 8 seed Karolina Pliskova of the Czech Republic next. They met in the first round of the US Open in 2016, when Kenin had earned a wild card via the USTA's Wild Card Challenge. Pliskova won 6-4, 6-3, but Kenin has continued to improve since that meeting, as her steady rise up the rankings indicates. Both USTA National junior doubles champions won a set today from their opponents, but could not navigate the final sets. Patrick Kypson and DJ Thomas led 3-0 in the final set, but No. 10 seeds Feliciano Lopez and Marc Lopez of Spain won five of the last six games to earn a 4-6, 6-2, 6-4 victory. Caty McNally and Whitney Osuigwe played a poor first set and a good second set, but fell to Desirae Krawczyk and Australia's Monique Adamczak 6-1, 3-6, 6-2. Taylor Fritz def. Jason Kubler[WC](AUS) 6-3, 3-6, 6-3, ret. 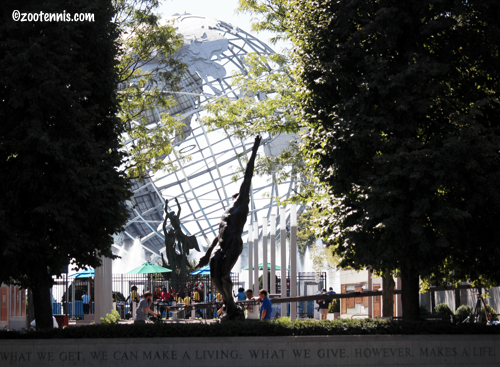 Day Two of the US Open was a hot one, with temperatures in the mid-90s and the heat index over 100. The women received the WTA Tour's standard 10-minute break between the second and third sets when the heat threshold is reached, but the men generally do not get one. The USTA announced today that it would, on advice from the tournament's medical staff, institute a break for the men today after the third set, but that didn't help the six men who retired from their matches today. Not all were due to heat issues, but the oppressive playing conditions certainly wouldn't help. None of the Americans who lost today retired, but the losses piled up anyway, with four of the men's wild cards going out, leaving the American men's wild cards 0-5 in the first round. Jenson Brooksby, the Kalamazoo 18s champion, started well against John Millman of Australia, but the match got less competitive as it continued, with Millman coasting to a 6-4, 6-2, 6-0 win. Frances Tiafoe was one of the bright spots of the day, beating No. 29 seed Adrian Mannarino of France 6-1, 6-4, 4-6, 6-4 in front of a supportive crowd on the Grandstand. Tennys Sandgren was the only other US man to advance, defeating Viktor Troicki of Serbia 6-3, 6-4, 6-2. Taylor Townsend and wild card Amanda Anisimova had a close battle, with Townsend coming back for a 3-6, 6-4, 6-3 win. Anisimova, who is coming back from a foot fracture she suffered in March, has played only three tournaments since her return, and she looked a few matches short of top form. Townsend had trouble converting break points in the first two sets and managed only 4 of 16 overall, but in the third set she got a break for a 4-2 lead and stayed in front, closing out the match with a hold at love for her first US Open main draw win. In the other all-US match, qualifier Francesca Di Lorenzo defeated Christina McHale 6-1, 7-6(1) to earn her first slam win in her first slam main draw appearance. The 21-year-old, who turned pro after her sophomore year at Ohio State last year, will play No. 13 seed and Cincinnati champion Kiki Bertens of the Netherlands in the second round Thursday. Bernarda Pera also posted a victory today, defeating Yulia Putintseva of Kazakhstan 7-6(6), 6-4. Doubles play for both men and women begins on Wednesday, with both USTA National 18s champions in action. Girls winners Whitney Osuigwe and Caty McNally play Monique Adamczak of Australia and Desirae Krawczyk, the former Arizona State standout. Boys winners Patrick Kypson and DJ Thomas will take on No. 10 seeds Feliciano Lopez and Marc Lopez of Spain. Not many Americans made the trip to Repentigny Canada for the ITF Grade 1, and only one remains in singles after the completion of the second round: unseeded Emilio Nava. Nava defeated No. 13 seed Jonas Forejtek of the Czech Republic 7-5, 6-3 to reach the third round. Dalayna Hewitt, Drew Baird and Tristan Boyer all lost their first matches after receiving byes in the first round. The first day of the US Open saw American players go 11-13, with all four qualifiers playing today going out, as well as three wild cards and a lucky loser. Several young Americans reached the second round with wins three-set wins today, including Sonya Kenin. Although just 19, Kenin already has a long history in New York. She played her first main draw match at the US Open as a 16-year-old in 2015, getting in as a wild card after winning the USTA National 18s title in San Diego. Kenin reached the final of the US Open girls championship that year, then earned another wild card into the women's main draw in 2016, via the USTA's US Open Wild Card Challenge. Last year, Kenin won the Wild Card Challenge again, and picked up her first US Open main draw victory, over Lauren Davis, and her second, in a dramatic third-set tiebreaker over Sachia Vickery, before falling to Maria Sharapova. This year Kenin earned her place in the main draw via her ranking, not a wild card, and today played lucky loser Madison Brengle. Up 6-0, 2-0, Kenin was rolling, but Brengle fought back, took the second set and went up 4-1 in the third. Kenin, not one to throw in the towel, ever, saved three match points to take it two a third set tiebreaker, and she came out of it with a 6-0, 4-6, 7-6(4) victory. She will play No. 32 seed Maria Sakkari of Greece, who beat this year's USTA Wild Card Challenge winner Asia Muhammad 6-3, 6-3. 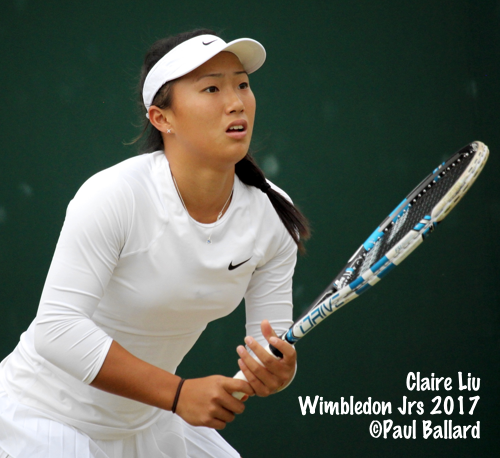 Claire Liu won her first main draw match at a slam at Wimbledon last month, and took the only set champion Angelique Kerber surrendered in the tournament in a second round loss. Today Liu earned her first win at the US Open, beating Polona Hercog of Slovenia 7-6(4), 1-6, 6-4. The 18-year-old Liu, who qualified last year but dropped her first match, led 4-1 in the final set, lost her break, but came back to break again for the win. Current USTA 18s National Champion Whitney Osuigwe's slam debut ended with a first round defeat, with the 16-year-old former junior No. 1 falling to Camila Giorgi of Italy 6-4, 6-1. Osuigwe played well during stretches of the match, getting back on serve in the first set after trailing 4-1, but she was broken to end the first set, and could not break Giorgi in the second set. The day's most dramatic comeback saw 20-year-old Taylor Fritz come from two sets down to beat Mischa Zverev of Germany 4-6, 2-6, 6-4, 7-6(2), 6-2. Fritz was down 2-0 in the final set, but won the last six games of the match from a tired looking Zverev to claim his first five-set victory. He plays wild card Jason Kubler of Australia next. For comments from Fritz, which emphasize how his fitness contributed his win, see this article from the ATP. Andreas Seppi(ITA) def. Sam Querrey 6-7(8), 6-4, 6-2, 2-1 ret. 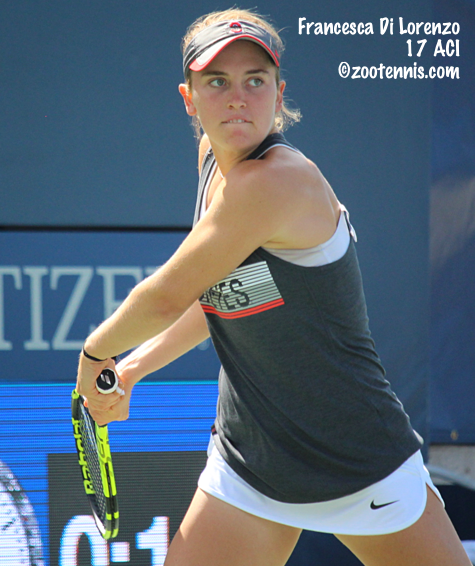 Kalamazoo 18s champion Jenson Brooksby will be in action on Tuesday, with the 17-year-old taking on John Millman of Australia second on after 11 on Court 6, and 2017 US Open girls champion Amanda Anisimova will play Taylor Townsend at 11 am on Court 11. Monday marks the beginning of 2018's final slam, with 24 Americans--all those in the top half of the draw--in US Open singles action Monday. 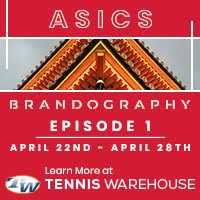 Below are Monday's matches featuring US players, which includes just two all-US matchups: John Isner and Bradley Klahn and Sonya Kenin and Madison Brengle. Brengle received her spot as a lucky loser Sunday when Luksika Kumkhum of Thailand withdrew due to travel problems. The WTA website has an excellent review of all the women making their slam debuts at this year's US Open, with Americans Whitney Osuigwe and Francesca Di Lorenzo among those featured. The doubles draws have been released (women's and men's), with NCAA champions Martin Redlicki and Evan Zhu receiving a wild card into the men's doubles draw, along with Kalamazoo champions DJ Thomas and Patrick Kypson. Osuigwe and Caty McNally received a women's wild card as San Diego champions. 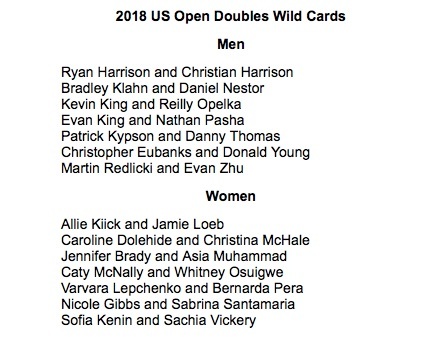 Below is the complete list of doubles wild cards. Americans Max McKennon and Jenna DeFalco won the singles titles at the ITF Grade 4 in Monterrey Mexico this week. The 16-year-old McKennon, who was unseeded, took out No. 1 seed Marcelo Sepulveda Garza of Mexico in the second round and claimed his first ITF Junior Circuit title with a 6-4, 6-2 win over unseeded Amador Salazar of Chile in the final. The unseeded DeFalco, 15, who also won a Grade 4 title last week in Monterrey, ran her winning streak to ten, beating top seed Rut Galindo of Guatemala 6-4, 6-0 in the final. DeFalco and partner Elizabeth Stevens also reached the doubles final. At the Grade 5 in Trinidad and Tobago, Benjamin Kittay won the boys doubles title, partnering with Tom Leblanc Claverie of France. The top seeds defeated No. 2 seed Donte Armbrister of the Bahamas and Romani Mayers of Barbados 6-1, 6-3 in the final. The main draw of the ITF Grade 1 in Repentigny Canada got underway today, although with a 48 draw, none of the seeds were in action. Seeded American boys are Tristan Boyer and Drew Baird. Hugo Gaston of France is the top boys seed. The only US girl seeded is Dalayna Hewitt, who is No. 13. Clara Tauson of Denmark is the top girls seed. One champion needed only seven games to earn his ITF Grade 1 International Hard Court title, the other went just seven minutes short of three hours to claim hers, but both Gilbert Soares Klier Junior of Brazil and Katie Volynets of the United States will leave the Junior Tennis Champions Center for the US Open with a winning streak and confidence. Klier, seeded eighth, earned his second Grade 1 title this year in just 30 minutes, getting the victory when the Dominican Republic's Nick Hardt retired down 5-2 in the first set. The No. 9 seed, Hardt was suffering from an injury to his left foot, a swelling that necessitated cutting open his shoe to relieve the pressure prior to the match. "I was fighting, I was trying my best, it was painful," said Hardt, who began to feel pain in his foot after his doubles semifinal on Friday. "I planned just to play two or three games maximum, and I tried my best, but I just couldn't. It was my first Grade 1 final and this happened. But it's fine, sometimes it happens, you just learn about it and get better." For Klier, who, as Hardt's doubles partner, knew about the injury prior to the match, was able to focus enough to get a lead, but acknowledged that situation can be diffcult. "It's kind of different," said the 18-year-old Klier, who is coached by fellow Brazilian Arthur Rabelo. "You know he's injured, but it's a little bit pressure, but it's ok, it's normal." In the sixth and seventh games, Hardt was hitting plenty of drop shots and serving and volleying in an attempt to shorten points. "I think that was because he was feeling a lot of pain," said Klier. Despite the way the final ended, Klier said he was happy with his performance throughout the week, and he accomplished the goal he set for himself prior to the last junior slam of the year. "I played well and it was a good week for me," said Klier, who won the Grade B1 South American Closed in March. "In the US Open, I will be a seed, and I played this tournament to get a seed. I don't know if I will play [the Grade 1 next week in] Canada, because I'm a little bit tired." The girls final made up for the abbreviated boys match, with No. 5 seed Volynets coming from 3-0 and two breaks down in the third set to claim the title with a 4-6, 6-3, 6-4 win over No. 16 seed Hurricane Tyra Black. The tone was set in the 65-minute first set, which went to Black, but only after Volynets had saved five set points: two with Black serving at 5-3 and then three more with Volynets serving at 4-5. Black was certain Volynets' shot on the fifth set point was wide, but no call was made by the line judge or the chair umpire. On the sixth set point, Volynets thought here forehand had caught the corner, but it was called out, finally ending the set. "That game was obviously long," said Volynets. "She did have six set points and I was staying super consistent in those, not missing a single shot. On the sixth one, I actually made the right decision to move in on that one and take it on the rise, but unfortunately it was a little out, I'm not sure." Volynets agreed that the last two games of the first set helped her in the second, although there were only three holds of serve in the nine games, with Volynets holding via some good serving to make it 5-3 and breaking Black for the fourth time to level the match. Black returned from a bathroom break to take a quick 3-0 lead, breaking Volynets in the first and third games and holding at love in between. Volynets, who keeps her emotions in check, didn't show any signs of frustration, and she was able to adjust to Black's aggressive pace at the beginning of the set. "There was a ball change, the ball was moving faster, and also, I think she started slicing less," said the 16-year-old from Northern California. "She was hitting the ball heavier. I think I started reacting better to those balls, which helped me to defend better, and to get my depth back up again. That made a big difference." Black could not consolidate the second break and when Volynets held for 2-3, the outcome was much less certain. When Volynets broke Black again, Black began to voice her frustration, which she agreed was a relapse from her recent improvement in that area. "I think it had to do honestly with my mental toughness in that match," said Black, a 17-year-old from Florida. "I went up 3-0 in like five minutes in the third set, and after that I just kind of focused on everything but the match, and I couldn't get back to it after that." After Volynets won her fifth straight game, she served for the match, but Black went up 15-40 in the game. Black hit a shot that appeared clearly a few inches beyond the baseline, but there was no call from the chair umpire, and after some confusion as to the game score, Black was awarded the game. "That was very tough to forget about," Volynets said of the lack of a call on that break point. "I saw a big space with that ball and that was a really crucial point, but then I thought, this isn't the end of the match. If I can get myself back together, I have a great chance to break her serve and my positive thoughts really helped me." Volynets was able to break Black for the win, and after Black made an error to end the match, she berated herself again using an audible expletive, then after shaking hands with Volynets and the umpire, immediately left the court, skipping the trophy ceremony. Volynets, who had the trophy photo shoot to herself, said that her own outward calm during the match was "definitely" a factor in the outcome. "I obviously feel things inside," said Volynets, who won the ITF Grade B1 Easter Bowl in April. "But I make sure not to say them out loud. I try to calm myself down immediately so that I can focus on the next point rather than what happened previously." Unlike Klier, Volynets has no idea what impact the title will have on her ranking as she prepares for the US Open, where she reached the quarterfinals last year. "I just came to play this tournament to prepare for the US Junior Open, to get some matches, of course," Volynets said. "I feel the surface is pretty similar in speed, at least it was last year, and that was my goal coming into the tournament." Neither Volynets nor Black will play the Grade 1 in Canada next week, with Black returning to Florida to train and Volynets staying on in College Park with several USTA coaches and juniors to prepare for the US Open. With Hardt's injury, the boys doubles final could not be played, so the unseeded team of Eliot Spizzirri and Adam Neff won the title from Klier and Hardt by walkover. Spizzirri and Neff were disappointed that the final wasn't played. "We've been playing well all week and we thought we had a good chance today," Spizzirri said. "It's unlucky that he had to retire, but he had a great tournament in singles, and hopefully he's better by the Open. I feel bad for him." With no final to recount, Neff and Spizzirri could reflect on their semifinal win over No. 2 seeds Yanki Erel of Turkey, who won the Wimbledon boys doubles title last month, and Tao Mu of China. "It was a big win for us," Neff said of their 3-6, 6-1, 10-5 victory. "I think confidence-wise, it was really big for us to come back after losing that first set the way we did. They're obviously great players, both of them, in singles and doubles, so overall, it was just a huge win for us yesterday." Neff and Spizzirri, who are not playing in Canada next week, are hoping for a doubles wild card into the US Open Junior Championships, with Spizzirri scheduled to play in the singles qualifying in New York beginning next Friday. 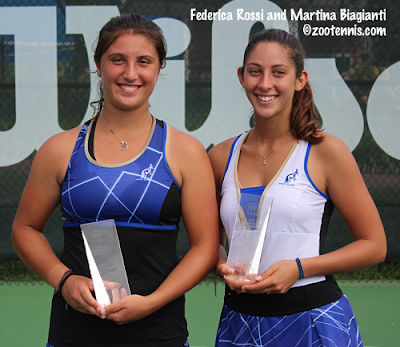 The girls doubles champions are the unseeded team of Martina Biagianti and Federica Rossi of Italy, who beat No. 8 seeds Loudmilla Bencheikh of France and Anastasia Tikhonova of Russia 6-1, 6-4. Biagianti and Rossi said they saved their best performance of the week for the final, after going to a match tiebreaker in three of their four matches prior to Saturday's final. "It was maybe the best match of the week," said Biagianti. "Every important point, deuce point, we won. All good. Today was everything good. And we are happy to be the winners this week." "This is second or third time we play together," Rossi said of their partnership, which will continue next week in Canada. "We have to play more doubles in the future together." For complete draws and a photo gallery, see the tournament website. 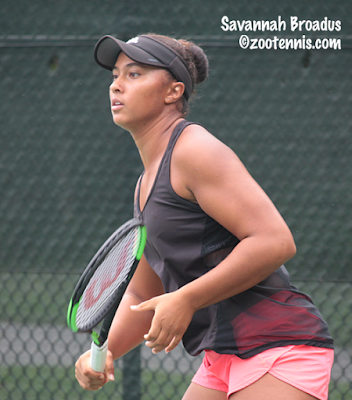 Two Americans will meet Saturday for the girls title at the ITF Grade 1 Prince George's County International Hard Court Championships, while two longtime friends and doubles partners will face off in the boys final. Both No. 5 seed Katie Volynets and No. 16 seed Hurricane Tyra Black had reached Friday's semifinals without dropping a set, and that trend continued, with Volynets defeating No. 7 seed Sada Nahimana of Burundi 6-2, 6-1 and Black taking out No. 10 seed Ludmilla Bencheikh of France 6-3, 6-3. Volynets had played Nahimana in the first round of this same tournament last year and won by the same score, although today's match took nearly 90 minutes to complete, with a majority games going to deuce, most of them on Nahimana's serve. "I was trying to attack her serve, but sometimes I don't think I was aggressive enough," said the 16-year-old from Northern California. "I had to keep my focus, keep on trying to stay aggressive and stay forward to pull out those deuce games." Black was pleased with her overall game against Bencheikh, who had beaten No. 1 seed Alexa Noel in the quarterfinals, with her backhand particularly effective throughout the match. 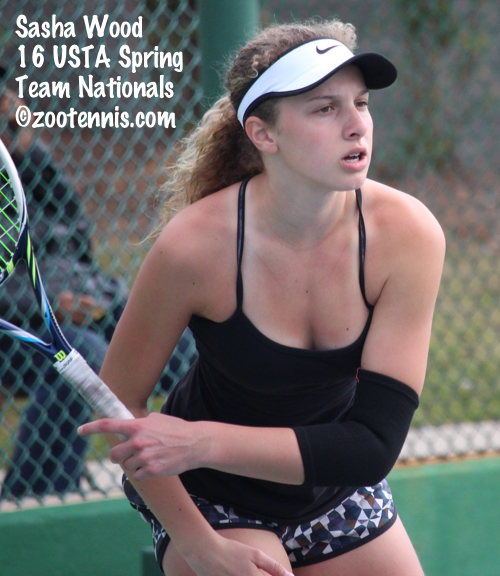 "I went on the court with an open mind," said the 17-year-old from Florida, who won the ITF Grade 1 International Spring Championships in April. "I played really loose and I was hitting the ball really well today. My backhand was feeling amazing today, today and yesterday, it's been going well and my forehand has been consistent too." Black had not played Bencheikh before and wasn't sure what to expect, but the USTA coaches in attendance, who watched Bencheikh's win over Noel, were able to give her some advice. "They told me her backhand was a little bit of a weaker shot," Black said. "That was a good thing, because my backhand was very strong today. Her serve wasn't that strong most of the time, especially in tight situations, so I was taking advantage of that." Black went up two breaks in the first set, gave one back, but was able to close out the set with a third break. She went up 3-0 in the second set, lost that lead, but broke Bencheikh serving at 3-4 and closed out the match with no drama. "I think I got a little ahead of myself, which I've done a lot in the past," Black said of losing that lead. "The good thing is, usually before I would go completely away after that, but lately I've been able to stay in it, especially when they fight for games, so that was really good today." Black and Volynets have played once before, at last fall's ITF Grade B1 Pan American Closed, with Volynets winning 6-3, 7-5 in the round of 16. 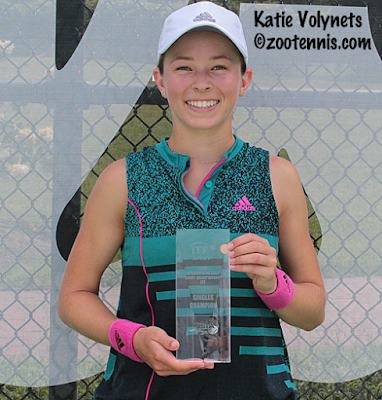 "I saw that she has a great slice, great variety," said Volynets, who won the ITF Grade B1 Easter Bowl this spring. "I'll keep that in mind and adjust to that. I'm really excited to play tomorrow, really happy to be here." While the girls semifinals were both completed with a minimum of drama, the boys brought the tension, with No. 8 seed Gilbert Soares Klier Junior of Brazil defeating No. 3 seed Tao Mu of China 6-4, 2-6, 6-4 and No. 9 seed Nick Hardt of the Dominican Republic coming from a break down in the third set to beat No. 4 seed Yanki Erel of Turkey 7-6(4), 4-6, 6-4. Klier and Mu had one lengthy rally after another, with neither giving up their position near the baseline. Klier got the only break of the first set and held on, leading Mu to raise his level in the second set. At 3-all in the third set, Mu was unable to convert his game point, and on break point he didn't get a first serve in. Klier took advantage, hitting a return winner, and although Mu forced him to serve it out, the 18-year-old Brazilian converted his second match point for the title. "It was tough," said Klier, who had not lost a set prior to today's match. "I played very well, but the guy also played well. He's very fast, has a great serve and a great forehand, yeah, he's good." While Klier was able to get off the court in just under two and a half hours, Hardt needed nearly another hour long to earn his spot in the final. The first set, which took 75 minutes to complete, was one deuce game after another, and when Erel couldn't close it out serving for it at 5-3, a tiebreaker was needed. Erel had a 4-2 lead at the change of ends, but he didn't win another point, with Hardt coming up with several winners in the five straight points he won, including a backhand winner on his first set point. In the second set, Erel was able to serve out the set after a late break, and the 17-year-old left-hander was up 3-1 in the third set, but Hardt kept the pressure on, and on his fourth break point of the sixth game, got the score back to 3-all with a return winner. After so much tension, the final game proved anticlimactic, with Erel broken at love serving at 4-5. "I think the key was I was in better shape, physically, than him," said Hardt, who turns 18 next month. "I didn't get tired at all, and I think also, mentally, I was really strong today. Those were the two keys today." Hardt was pleased with how he handled being down in the final set. "I stayed positive, didn't get negative at all," said Hardt, who will be playing in his first Grade 1 final Saturday, although he did reach the final of the Grade A in Brazil earlier this year. "In a few important moments, if you play bad, with him, the match can go right away. I'm happy I was positive the whole day and wasn't complaining on court." Hardt and Klier have not played, but Hardt knows what to expect. "I'm for sure going to fun out there tomorrow," Hardt said. "He's a very good friend, my doubles partner. He's a very aggressive player, very solid. Good forehand, good backhand, overall he's a very complete player. Tomorrow, I'm just going to grind. It's going to be a very physical match and I hope I'm consistent tomorrow." 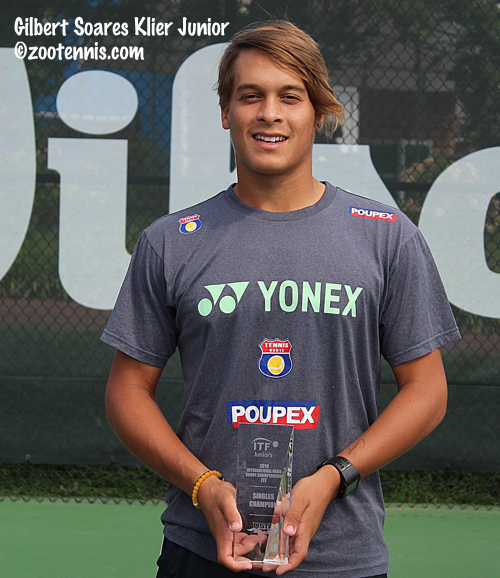 "He's got a great serve and a great forehand," said Klier, who won a Grade B1 Closed in Brazil in March. "He's fast, so I play my game, my match, and that's it." After their singles final, Hardt and Klier will play the doubles final against the unseeded American team of Eliot Spizzirri and Adam Neff. Hardt and Klier, the No. 3 seeds, defeated top seeds Juan Cerundolo and Facundo Diaz Acosta of Argentina 7-6(5), 6-7(4), 10-6 in Friday afternoon's semifinal. Neff and Spizzirri beat No. 2 seeds Erel and Mu 3-6, 6-1, 10-5 to advance to the final. The girls doubles final will feature the unseeded Italian team of Martina Biagianti and Federica Rossi against the No. 8 seeds Bencheikh and Anastasia Tikhomova of Russia. Biagianti and Rossi defeated unseeded Black and Melania Delai of Italy 6-7(2), 7-6(5), 11-9, while Bencheikh and Tikhomova beat unseeded Ariana Arseneault and Jada Bui 6-3, 6-1. For Saturday's order of play see the tournament website. Qualifying is complete for next week's US Open, with three US men and three US women earning entry into the main draw with wins today. Donald Young defeated No. 12 seed Peter Polansky of Canada 7-5, 1-6, 6-3 and will be playing in his 14th consecutive main draw at the US Open since first earning entry was a wild card as Kalamazoo 18s champion back in 2005. Mitchell Krueger will be making his main draw debut at the US Open after beating Calvin Hemery of France 3-6, 6-4, 6-2. Krueger saved three match points in his second round win over Thai Kwiatkowski Thursday. Collin Altamirano, who received a late wild card into qualifying, defeated No. 10 seed Lorenzo Sonego of Italy 6-4, 7-6(3), and will make his first appearance in the US Open main draw since winning the Kalamazoo 18s wild card back in 2013. Nicole Gibbs, the No. 10 seed in qualifying, beat Olga Govortsova of Belarus 6-4, 6-1 to make the main draw of the US Open for the seventh straight year. Danielle Lao, who qualified for last year's US Open, did it again this year, beating the same player, Jana Fett of Croatia, in the final round of qualifying, although this year Lao did it in straight sets, 6-4, 6-4. Francesca Di Lorenzo will make her slam debut after beating No. 8 seed Mona Barthel of Germany 6-4, 6-2. All three US women advanced through three rounds of qualifying without dropping a set. The qualifiers have been placed in the draws, with Young playing No. 3 seed Juan Martin del Potro of Argentina, Krueger playing Roberto Carballes Baena of Spain and Altamirano playing fellow qualifier Ugo Umbert of France. Gibbs will play No. 30 seed Carla Suarez Navarro of Spain, Di Lorenzo will play Christina McHale, and Lao will play No. 23 seed Barbora Strycova of the Czech Republic. In addition to the Americans who qualified, another former college player is also into the main draw, with Yannick Madden of Germany, who played at Clemson 2010-2013, beating Alex Bolt to qualify for his second consecutive slam. Eighteen-year-old Felix Auger Aliassime of Canada qualified and has drawn friend and junior rival Denis Shapovalov of Canada in the main draw. Auger Aliassime, the 2016 US Open boys champion, defeated Shapovalov in the final of the ITF Grade 1 here in College Park three years ago. My coverage of that final is here. Men's draws are here; women's draws are here. For the second consecutive day, the top seed was eliminated at the ITF Grade 1 Prince George's County International Hard Court Championships. A day after boys top seed Nicolas Mejia fell, girls No. 1 seed Alexa Noel went out, dropping a 3-6, 6-4, 6-2 decision to No. 10 seed Loudmilla Bencheikh of France in the quarterfinal round. Noel started off well on a clear and crisp morning at the Junior Tennis Champions Center, and given her two recent straight-sets wins over Bencheikh, there was little reason to expect a different result. But Bencheikh was determined not to get frustrated by Noel's unusual game style, which includes little pace and an abundance of slices, both on the forehand and the backhand. "I think I was more patient than the other times," said the 17-year-old, whose previous two losses to Noel were on clay. "I used my forehand better than the last time and my serve too. For me, it's difficult to play her. It's so hard to play fast and every time she gives another ball to play, so it's really hard. To do a point, you have to do ten shots, it's hard." Bencheikh began to see the results of her patience in the second set, when Noel's errors became more frequent. "I was not trying to win the points on one shot or two shots," said Bencheikh, who has advanced to a Grade 1 semifinal for the second time. "There was so many long points. I'm really happy to win this match because it's really hard to play against her." Bencheikh will take on another American with a penchant for slicing in No. 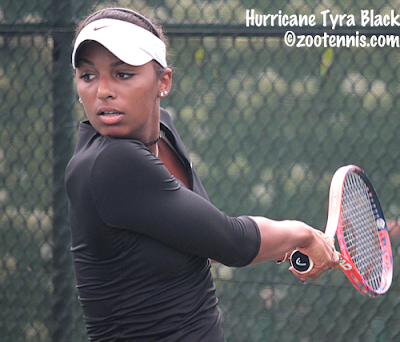 16 seed Hurricane Tyra Black, who defeated No. 9 seed Natasha Subhash 6-2, 7-5 in today's quarterfinals. Black, who beat No. 3 seed Margaryta Bilokin on Wednesday, has yet to drop a set, and is finding a balance between offense and defense that her opponents can't disrupt. The other girls semifinal will feature No. 5 seed Katie Volynets against No. 7 seed Sada Nahimana of Burundi. Volynets advanced when No. 14 seed Ana Geller of Argentina retired down 6-1, 2-1. Geller had her thigh heavily wrapped during a medical timeout and has withdrawn from the Grade 1 in Canada next week, but is hoping to play the US Open Juniors. Nahimana fought back to end the run of unseeded Canadian Alexandra Vagramov 3-6, 6-4, 6-2. Only one of the boys quarterfinals went to three sets, and that was No. 9 seed Nick Hardt's 4-6, 6-1, 6-3 win over No. 16 seed Govind Nanda. Hardt was broken serving at 4-5 in the first set, but didn't allow himself to get discouraged. "He started very well, a very solid first set for him," said the 17-year-old from the Dominican Republic. "I started well, just one game I didn't play my best, but he played smarter than me that game." The second set went quickly, with Hardt playing well and Nanda unable to match that level. "He didn't play that good in the second set, but the third set, it was lucky for me," Hardt said. "Anyone could have won that set." Hardt led 4-1, but Nanda got the break back, only to drop serve at 3-4, with a double fault ending the game. Hardt fell behind 15-30 serving for the match, but won the next two points to get to match point. Nanda thought he had hit a backhand winner that caught the far sideline to keep the match going, but Hardt called it out and the roving umpire confirmed Hardt's call. Hardt, who made the semifinals of the ITF Grade B1 Pan American Closed last fall, will face No. 4 seed Yanki Erel of Turkey, who beat No. 6 seed Drew Baird 6-2, 6-4. "I saw him play at Wimbledon this year," said Hardt, who has not played Erel before. "He has a very good serve, very good forehand, very flat backhand. It's for sure going to be a very tough match tomorrow. I feel I need to attack the backhand side and come more to the net. That's going to be my strategy for tomorrow." The other boys semifinal will feature No. 3 seed Tao Mu of China against No. 8 seed Gilbert Soares Klier Junior of Brazil. Mu breezed past unseeded Cezar Cretu of Romania 6-1, 6-1, while Soares had a similarly routine win over No. 13 seed Dostanbek Tashbulatov of Kazakhstan 6-1, 6-3. Six of the eight singles semifinalists have also reached the doubles semifinals after two round of doubles were played Thursday afternoon. Black and her partner Melania Delai of Italy will face Martina Biagianti and Federica Rossi of Italy in a match between two unseeded teams. Bencheikh and her partner Anastasia Tikhonova of Russia, the No. 8 seeds, will meet the unseeded Canadian team of Ariana Arseneault and Jada Bui in the other semifinal. The boys semifinalists are all still in doubles, with Erel and Mu, the No. 2 seeds, facing unseeded Adam Neff and Eliot Spizzirri, and Hardt and Soares, the No. 3 seeds, playing top seeds Juan Cerundolo and Facundo Diaz Acosta of Argentina. Friday's order of play can be found at the tournament website. Six US women and four US men have advanced to the final round of qualifying Friday at the US Open, including six former college stars. No. 10 seed Nicole Gibbs, a two-time NCAA singles champion at Stanford, defeated Tamara Korpatsch of Germany 6-4, 7-6(6) and will face Olga Govortsova of Belarus for a spot in the main draw. Jamie Loeb, the 2015 NCAA champion from North Carolina, defeated No. 18 seed Ysaline Bonaventure of Belgium 6-4, 6-4 and will play No. 16 seed Eugenie Bouchard of Canada in Friday's final round of qualifying. Former USC standout Danielle Lao beat Conny Perrin of Switzerland 6-4, 7-5 and will play No. 19 seed Jana Fett of Croatia Friday. Francesca Di Lorenzo, the 2017 NCAA doubles champion while at Ohio State, defeated Antonia Lottner of Germany 6-4, 7-5 and will face No. 8 seed Mona Barthel of Germany. No. 3 seed Madison Brengle, a 6-3, 6-7(5), 6-2 winner over Tereza Smitkova of the Czech Republic, plays No. 32 seed Anna Kalinskaya of Russia, who won the International Hard Courts Grade 1 here in College Park in 2014 and 2015, for a place in the main draw. Jessica Pegula defeated Arina Rodionova of Australia 6-3, 6-1 and will play Patty Schnyder of Switzerland in the final round of qualifying. JC Aragone, who qualified at last year's US Open, reached the final round of qualifying again this year, beating No. 7 seed Thomas Fabbiano of Italy 7-5, 6-1. He will play No. 30 seed Lloyd Harris of South Africa on Friday. Aragone's former Virginia teammate Collin Altamirano defeated No. 22 seed Ivo Karlovic of Croatia 7-5, 6-4 and will face No. 10 seed Lorenzo Sonego of Italy for a place in the main draw. Donald Young defeated No. 29 seed Simone Bolelli of Italy 0-6, 6-4, 6-2 to earn a final round qualifying match with No. 12 seed Peter Polansky of Canada. The fourth US man to advance to the final round of qualifying is Mitchell Krueger, who beat Thai Kwiatkowski 3-6, 7-6(7), 7-5. Krueger will face Calvin Hemery of France on Friday. Friday's qualifying schedule is here. The draws for the men's and women's singles were revealed today, with Kalamazoo 18s champion Jenson Brooksby drawn to play 29-year-old Australian John Millman, ranked 54th, and San Diego 18s champion Whitney Osuigwe scheduled to play Camila Giorgi of Italy, ranked 45th. No. 16 seed Govind Nanda had a plan for his first encounter with top seed and defending champion Nicolas Mejia of Colombia, and although the 17-year-old Californian would not say he executed it perfectly, he did come away with a hard-fought 7-6(4) 7-5 victory in the third round of the ITF Grade 1 Prince George's County International Hard Court Championships. "I came in a lot," Nanda said. "I really don't want to tell you what my strategy was, I don't want to expose that to everyone. My main focus was to try to get a lot of first serves in. I don't think I served that great today, honestly; I served better in my previous matches. And I was trying to make every return, get them deep. His serve's pretty good and it'd tough to do that, but I thought I did a pretty good job of that after all." Nanda overcame a seven-minute rain delay serving at 5-all 15-30 in the first set, then got off to a great start in the tiebreaker, going up 3-0. He extended that lead to 6-2, gave one of the mini-breaks back, but took the set with a forehand winner. The second set, which again featured a short rain delay, wasn't played on quite the same level, but the arguments over line calls continued, even after Nanda had conceded a point in the opening set. "I thought he made some questionable calls," Nanda said. "Whether they were in or out was a different story, but they were definitely close. I gave him a call at 3-4 in the first, break point me, I hit a ball long, I knew for sure it was wrong, the ref overruled him and I ended up giving him the point. It didn't calm down after that, if anything it made it more chatter-y." Nanda went up a break twice in the early stages of the second set, but Mejia broke back and took a 4-3 lead. Nanda held another long service game for 4-all and Mejia managed to fight off three break points in the next game for 5-4. An easy hold for Nanda followed, a rare occurrence in the match, making it 5-all and then Mejia blinked. Two double faults and two errors gave Nanda the chance to serve out the match, but that final game wouldn't come easily. At 15-all, Nanda was overruled by the roving umpire, stationed on court throughout the match, on a sideline call on a Mejia pass. But Nanda hit a reflex volley winner after Mejia had an easy putaway opportunity, a shot that brought applause from the usually sedate spectators watching from the Junior Tennis Champion Center's porch. "That was a pretty big point, actually, 15-30," Nanda said. "Most guys I feel like going inside in on that shot, I do also, so I kind of stood there and hoped for the best." Nanda had to save two break points in that final game to avoid another tiebreaker, but he did make two first serves after the second deuce to assist in claiming the victory. "It was a pretty tough match," Nanda said. "It was pretty physical, a lot of long points and it was pretty humid, pretty hot out there. I thought I played well on the big points.... I thought I stayed mentally tough and I managed to get through it, and I'm pretty happy about it." Nanda will face No. 9 seed Nick Hardt of the Dominican Republic in Thursday's quarterfinals after Hardt eliminated No. 5 seed Juan Cerundolo of Argentina 7-5, 6-0. The other quarterfinal in the boys top half will feature No. 4 seed Yanki Erel of Turkey against No. 6 seed Drew Baird. The only unseeded boy remaining in the draw is Cezar Cretu of Romania, who will play No. 3 seed Tao Mu of China. The fourth quarterfinal has No. 8 seed Gilbert Soares Klier Junior of Brazil against No. 13 seed Dostanbek Tashbulatov of Kazakhstan. The girls quarterfinals also will have one unseeded player, with Alexandra Vagramov of Canada earning her place in the final eight with a 4-6, 7-5, 6-3 win over No. 15 seed Francesca Curmi of Malta. Vagramov's opponent is No. 7 seed Sada Nahimana of Burundi, who beat No. 11 seed Elli Mandlik 1-6, 6-2, 6-3. No. 5 seed Katie Volynets will play No. 14 seed Ana Geller of Argentina, and top seed Alexa Noel will face No. 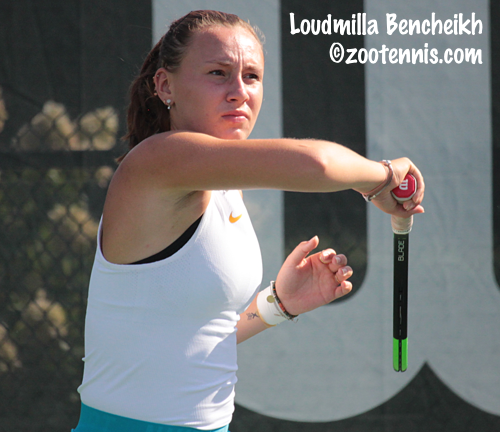 10 seed Loudmila Bencheikh of France. The No. 2 and No. 4 seeds lost in the second round and today No. 3 seed Margaryta Bilokin of Ukraine exited, losing to No. 16 seed Hurriance Tyra Black 6-4, 6-3. Black had beaten Bilokin, who was the top seed, in the semifinals of the ITF Grade 1 in Carson back in April, and she used much of the same strategy in today's match. "I feel like I had a little bit of a mental edge, because I won the last time we played," said Black, who now has two wins over Bilokin on hard courts, with Bilokin winning their meeting last year on clay. "I really have nothing to lose when I play her." Black's slicing and change of pace make getting into a rhythm difficult, and Black added another facet to her game style today. "I was mixing it up a lot today," said Black, 17. "I feel like she had a little trouble with that; I was hitting slices, lobs and then whenever I got the chance I would just go for it down the line and that threw her off a little bit. And I started coming to the net a little bit; that's not something I usually do, but I've been doing it really well this week so maybe I'll put it in my game." In all eight quarterfinals, only one features players who have played before on the ITF Junior Circuit, with Noel holding a 2-0 head-to-head with Bencheikh. All first round doubles matches were completed today, and a few second round matches were played, with No. 2 seeds Subhash and Volynets falling to Martina Biagianti and Federica Rossi of Italy 7-6(3), 6-3 in their second round match. Black and Melania Delai of Italy defeated No. 3 seeds Mylene Halemai of France and Hong Yi Cody Wong of Hong Kong 6-0, 6-2, also in a second round match. For Thursday's order of play, which features 12 second round doubles matches and all eight doubles quarterfinal matches, can be found at the tournament website. 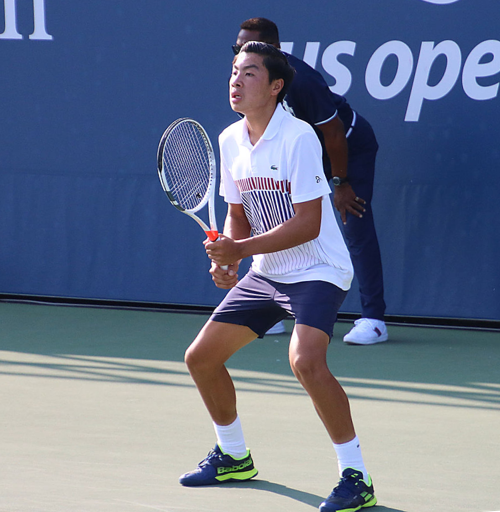 American women had a tough Day Two at US Open qualifying as the first round was completed, but the men picked up six wins against only three losses, including a thriller by Kalamazoo 18s finalist Brandon Nakashima. Nakashima, who turned 17 earlier this month, served for the match in the third set against 29-year-old Ante Pavic of Croatia, but was unable to get to a match point. Instead, he had to test his nerves in a third set tiebreaker, but he came through on his second match point to earn a 3-6, 6-4, 7-6(5) victory. He will play No. 24 seed Ugo Humbert of France in Thursday's second round. Ernesto Escobedo picked up a big win, defeating the No. 1 seed in qualifying, Jozef Kovalik of Slovakia, 6-2, 3-6, 7-6(4). Two more University of Virginia alumni advanced to the second round: Collin Altamirano and Thai Kwiatkowski join JC Aragone, who won his first round match on Tuesday. Chris Eubanks and Mitchell Krueger are the others advancing today, with Krueger scheduled to meet Kwiatkowski in Thursday's second round. US men competing in the second round Thursday are: Escobedo, Nakashima, Bjorn Fratangelo, Evan King, Christian Harrison, Aragone, Eubanks, Altamirano, Krueger, Kwiatkowski, Donald Young and Sebastian Korda. Overall, US men went 12-6 in first round qualifying. Although Bethanie Mattek-Sands was still playing her first round match when it was suspended by rain this evening, the US women could manage only two wins today, with Danielle Lao and No. 3 seed Madison Brengle advancing to Thursday's second round. Mattek-Sands, who split sets with Tereza Smitkova of the Czech Republic tonight, could join Lao and Brengle as well as the seven US women who won on Tuesday: Kristie Ahn, Nicole Gibbs, Varvara Lepchenko, Gail Brodsky, Jessica Pegula, Jamie Loeb and Francesca Di Lorenzo. Thursday's order of play is here. The draw ceremony is scheduled for 2 p.m. Thursday. 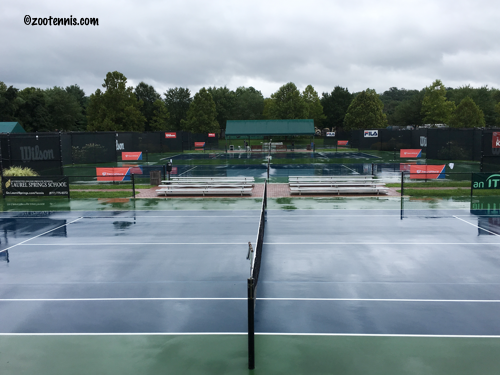 Rain that was predicted for the Washington DC area arrived just as players were taking the court for second round matches Tuesday morning at the ITF Grade 1 Prince George's County International Hard Court Championships. Fortunately the Junior Tennis Champions Center had eight indoor courts available, and the second round of singles were completed indoors, although many first round doubles matches were postponed. The most significant upset was Alexandra Vagramov's 2-6, 7-6(1), 7-5 win over No. 2 seed Lea Ma, one of eight girls second round matches that went to three sets. Vagramov, a 17-year-old Canadian, had lost to Ma twice in the past 14 months, including in the semifinals of January's ITF Grade 1 in Costa Rica. Yet even after dropping the first set, Vagramov was convinced she could come back. "In the first set, she was playing pretty aggressive and my game, I was just making too many errors, there were too many loose points," Vagramov said. "But I knew in the second, if I could just stay with her, but longer, find the opportunities to finish the points, I knew I could do it." Being from Vancouver, Vagramov is comfortable indoors. "I train a lot indoors in Canada, so I think that could have helped a bit," Vagramov said. "I think it helped my serve a lot." 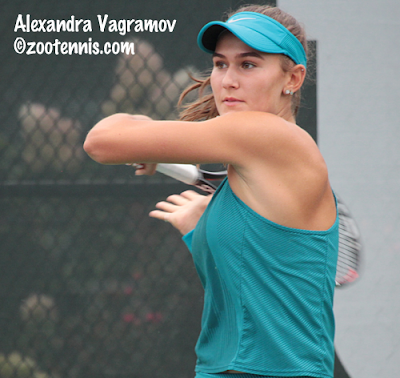 Vagramov is nearly 100 places lower than Ma in the ITF Junior rankings, so it was a satisfying win for her, particularly after the two previous losses. "She's a good player, really highly ranked, so it was a good opportunity, and it wasn't easy, obviously," Vagramov said. "I knew I had to stay in the points a bit longer, because I knew my shots were hard enough to penetrate the court if I could stay in the points and not make loose errors. My last junior results weren't too good, so today was a really good match and I'm happy." Another Top Four girls seed fell, with 15-year-old Alexandra Yepifanova beating No. 4 seed Hong Yi Cody Wong 6-2, 6-7(3), 7-6(4). Yepifanova, who is at least a foot taller than the diminutive Wong, served for the match twice in the second set, letting at least one match point slip away, but managed to maintain her composure and sneak out the win. Only one boys seed fell today, with No. 12 Tyler Zink losing to Liam Draxl of Canada 6-1, 3-6, 6-3, but several had tough battles. No. 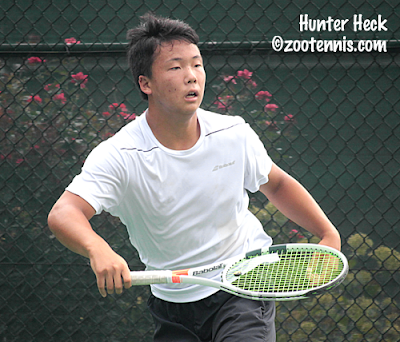 3 seed Tao Mu of China was tested by Zane Khan 4-6, 6-3, 5-3 retired, with the Kalamazoo 16s finalist again hampered by blisters. Khan took a medical timeout to have his foot wrapped, but during the next changeover in the second set, he undid the trainer's work. Mu looked to be suffering physically himself late in the third set, but Khan was focused on his own physical problems, visibly limping after a strenuous point, and after he was broken serving at 3-4, he retired. No. 5 seed Juan Cerundolo of Argentina was up 7-5, 4-1 on Filippo Moroni, but he couldn't close out the Italian, who was eager to finish points at the net when given the opportunity. Moroni stayed with him until the end, but Cerundolo earned the 7-5, 6-7(4), 7-5 victory. No. 13 seed Dostanbek Tashbulatov of Kazakhstan dropped the first set to Adam Neff, but fought back to force a third. In the final set, the first break came at 4-4, with Tashbulatov getting it and serving out the match at 40-30 for a 2-6, 6-4, 6-4 win. In all, seven of the 16 boys second round matches went three sets. Any boys who played singles Tuesday did not play their first round doubles matches, which were rescheduled for Wednesday. The bottom half of the girls doubles draw did complete their first round doubles matches, with some played indoors and some outdoors later Tuesday evening. For the order of play and draws, see the tournament website. The first day of US Open qualifying is complete with Americans posting 13 wins against 10 losses. Those advancing to the second round Thursday are: Kristie Ahn, Nicole Gibbs, Varvara Lepchenko, Gail Brodsky, Jessica Pegula, Jamie Loeb, Francesca Di Lorenzo, Bjorn Fratangelo, Evan King, Christian Harrison, JC Aragone, Donald Young and Sebastian Korda. Korda defeated Dennis Novikov 4-6, 7-5, 6-2 to pick up a win in his slam qualifying debut. Seventeen Americans are on the schedule for Wednesday, all in first round action: Coco Gauff, Danielle Lao, Lauren Davis, Madison Brengle, Bethanie Mattek-Sands, Grace Min, Ashley Kratzer, Irina Falconi, Ernesto Escobedo, Brandon Nakashima, Martin Redlicki, Reilly Opelka, Chris Eubanks, Collin Altamirano, Mitchell Krueger, Thai Kwiatkowski and Ulises Blanch. The women's qualifying draw is here; the men's qualifying draw is here. Only five seeds were eliminated Monday in the first round of the Prince George's County International Hard Court ITF Grade 1, but three of them were Top 8 seeds. Qualifier Hunter Heck pulled off the biggest upset, beating No. 2 seed Facundo Diaz Acosta of Argentina 7-5, 6-2, calling it "definitely" the best win of his career. Heck was thrilled with his level of play throughout his contest with the 10th ranked player in the ITF World Junior rankings. "I was doing everything well, everything was going my way," said the 16-year-old from Minnesota, who is ranked 424. "Shots were not going his way, I got a couple lucky bounces, lucky net cords, everything went my way today." Winning two matches in qualifying on the Junior Tennis Champion Center courts over the weekend gave Heck an advantage. "I think it helped, getting a couple of matches under my belt, getting the feel of the court, the facility," Heck said. "He didn't; it was his first match, and I'm just really happy." Heck believes that Diaz Acosta, a left-hander, was not as comfortable on the hard courts as on the red clay. "He was definitely a clay courter, the spin on his balls, the way he played, everything pointed to clay," Heck said. Heck said he "definitely was feeling the nerves" when it came time to serve out the first set, after getting a break to go up 6-5. "But I served well the whole match, so I'm proud of the way I served." Savannah Broadus, who defeated No. 6 seed Ana Makatsaria of Georgia 6-3, 6-4, was also confident in her ability to serve out the match. At 2-2 in the second set, Broadus got the break, then salvaged two more holds in close, tough games to give herself a chance to serve out the match. 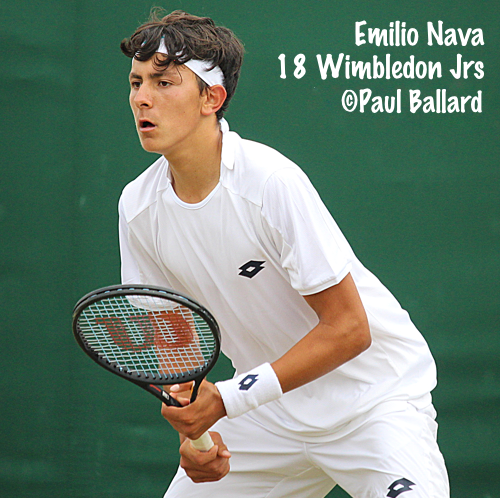 "I always like serving out matches," said the 15-year-old from Texas, who reached the round of 16 in the USTA National 18s earlier this month and advanced to the semifinals of a $15,000 ITF Pro Circuit tournament in July. "I'm very comfortable with my serve and I love serving. And I know I can set up my forehand with my serve. So I just felt calm, and knew I could close it out." Broadus started with an ace, the first of three first serves she made in the last game, and she held at love to finish it. Broadus said her success this summer helped her in Monday's first round against a Top 35 opponent. "It gave me confidence for today," said Broadus, ranked 118. "My past wins have made me more comfortable with my game style. Now when I go out on court I know how I want to play and I just feel better about myself when I walk out on court." The third Top Eight seed to exit on Monday was No. 7 seed Ray Ho of Taiwan, who lost to lucky loser Ilya Tiraspolsky of Canada 6-4, 6-3. No. 13 seed Kamilla Bartone of Latvia, who didn't enter the tournament and was forced to go through qualifying as an onsite alternate, lost to Kylie Collins 4-6, 6-1, 6-1 and No. 10 seed Andrew Fenty also lost in three sets, falling to Cezar Cretu of Romania 6-2, 0-6, 6-3. Top seeds Nicolas Mejia of Colombia and Alexa Noel got through in straight sets, but did not have easy first round matches. Mejia, the defending champion, trailed most of the first set to 14-year-old qualifier Jack Anthrop, and Anthrop served for the first set at 5-4, but Mejia broke back, then dominated the tiebreaker to set the tone for the second set in his 7-6(1), 6-0 victory. Noel couldn't serve out her match with Martina Biagianti of Italy at 5-2 in the second set, but she did hang on for a 6-1, 6-4 victory. No. 3 seed Margaryta Bilokin of Ukraine struggled with qualifier Elvina Kalieva, and saw a 4-1 third set lead nearly evaporate, but Bilokin saved a pair of break points to hold for 5-3, then broke the 15-year-old Kalieva to secure her 6-3, 4-6, 6-3 victory. No. 2 seed Lea Ma had one of the easiest wins of the seeded girls, taking out Celestine Avomo Ella of Gabon 6-2, 6-0. Doubles are scheduled to begin on Tuesday, with Argentina's Diaz Acosta and Juan Cerundolo the top boys seeds and Bilokin and Noel the top girls seeds. Tuesday's order of play and complete draws can be found at the tournament website. Qualifying begins for the US Open Tuesday at the USTA Billie Jean King National Tennis Center, with 23 of the 40 Americans in the men's and women's qualifying draws on the schedule. Below are the Americans in the qualifying draws, with an asterisk denoting those playing first round matches Tuesday. Colombia's Nicolas Mejia, who swept the titles last year the ITF Grade 1 Prince George's County International Hard Court tournament in College Park Maryland, is back to defend his titles. Ranked No. 4 in the world junior rankings and the No. 1 seed for the tournament, Mejia will face qualifier Jack Anthrop in Monday's first round singles action. No. 2 seed Facundo Diaz Acosta of Brazil, who is No. 10 in the world junior rankings, also faces an American qualifier in Hunter Heck. The top seeded American is No. 6 Drew Baird, who will play Daniil Glinka of Estonia in the last series of matches Monday afternoon. Three American girls are among the top eight seeds, including the top two seeds: Alexa Noel and Lea Ma. Noel, No. 5 in the world junior rankings, will face Martina Biagianti of Italy to open play on Monday, with Ma to follow her on court at the Junior Tennis Champions Center against Celestine Avomo Ella of Gabon. The other American seeded in the Top 8, No. 5 Katie Volynets, plays Federica Rossi of Italy in Monday's first round. This year the tournament's second site will not be the University of Maryland, as in the past, but the Greenbelt Community Center, where four courts will be used for 20 matches. For Monday's order of play, completed qualifying draws and singles main draws, see the tournament's website. I will be providing onsite coverage beginning tomorrow. At the $25,000 Futures in Boston, No. 3 seed Sekou Bangoura won his third Futures singles title of the year, beating top seed Antoine Hoang of France 7-5, 6-2. 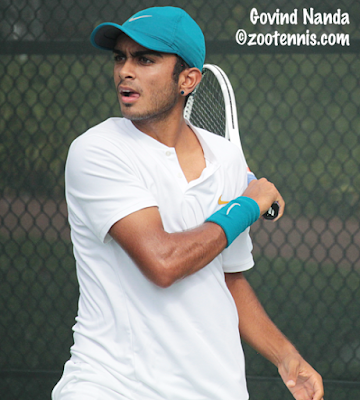 The former Florida star, now 26 years old, has also won two Futures doubles titles this year. His win today is his first title in the United States since 2016. The $100,000 ITF Women's Circuit tournament in Vancouver is still not complete, with Great Britain's Heather Watson facing qualifier Misaki Doi of Japan in tonight's final, but the doubles final was last night, with Giuliana Olmos(USC) of Mexico and Desirae Krawczyk(Arizona State) winning the title. Olmos and Kawczyk, the No. 2 seeds, defeated unseeded Kateryna Kozlova of Ukraine and Arantxa Rus of the Netherlands 6-2, 7-5 in the championship match. Last year the pair won five titles together, four at the $15-25,000 levels, one a $60K; this is their biggest title as a team, although Krawczyk did win a WTA doubles title last month with former Alabama star Alexa Guarachi. Unseeded Dan Evans of Great Britain won the men's singles title, beating No. 4 seed Jason Kubler of Australia 4-6, 7-5, 7-6(3) in just under three hours. The ITF Junior Circuit featured 15 tournaments on its schedule this week, with the Grade B2 Oceania Closed providing the most points. Restricted to those from Australia, New Zealand and the South Pacific Island, that tournament didn't have any Americans (Top seed Rinky Hijikata and No. 3 seed Amber Marshall of Australia won the singles titles), but they were represented in many of the other tournaments, and picked up titles on four continents. Sasha Wood won her fourth ITF junior doubles title of the summer, with her third different partner at the ITF Grade 3 in Zimbabwe. The 16-year-old from Massachusetts, who reached the singles semifinals, partnered with Weronika Baszak of Poland this week. The top seeds defeated unseeded Pimrada Jattavapornvanit of Thailand and Delien Kleinhans of South Africa 6-0, 6-4 in the final. At the ITF Grade 4 in Monterrey Mexico, Jenna Defalco won an all-US girls singles final. The 15-year-old, seeded No. 10, defeated No. 5 seed Elizabeth Stevens 6-2, 6-2 in the final for her second singles title, both coming this summer. Stevens, partnering with Russian Anfisa Danilchenko, won the doubles title, with the No. 2 seeds beating top seeds Rut Galindo of Guatemala and Lizette Reding of Mexico 6-4, 6-3 in the final. Unseeded Benjamin Kittay lost in the boys singles finals, 3-6, 6-3, 6-4 to No. 16 seed Pedro Boscardin Dias of Brazil. Jackson Ross, playing with Guillermo Castaneda of Mexico and seeded No. 6, fell in the boys doubles final to top seeds Alan Magadan and Marcelo Sepulveda Garza of Mexico 6-4, 4-6, 10-8. The ITF Grade 5 in Romania produced an American champion in 16-year-old Andrew Puscas, who won his first ITF junior singles title with a 6-1, 4-6, 6-4 win over No. 3 seed Dragos Popeanga of Romania. The unseeded Puscas has only played in Europe junior events, with no results in the US. At the ITF Grade 5 in Peru, Jennifer Kida won the doubles title, with partner Pilar Traiber of Argentina. The No. 2 seeds defeated No. 3 seeds Fiona Pepper and Daniela Ramos of Peru 6-2, 6-2 in the final. Ryan Johnson, seeded No. 3 with partner Carlos Aguiar of Chile, lost 6-1, 6-2 in the boys doubles final to top seeds Oscar Mendoza Govea of Ecuador and Esteban Penagos of Colombia. The final round of qualifying for the ITF Grade 1 in College Park Maryland, which I'll be covering beginning Monday, is scheduled for Sunday morning at the Junior Tennis Champions Center. Draws, Sunday's order of play and a photo gallery are available at the tournament website. At the only USTA Pro Circuit event this week, the $25,000 Futures in Boston, American Sekou Bangoura(Florida) has advanced to the final. The No. 3 seed defeated No. 2 seed Andrew Harris(Oklahoma) of Australia 2-6, 6-4, 6-4 in today's semifinal, and will face top seed Antoine Hoang of France for the title. Hoang beat No. 7 seed Alejandro Gomez(Kentucky) of Colombia 6-2, 6-2 in the semifinals. The doubles title went to 2018 NCAA champions Evan Zhu and Martin Redlicki. The UCLA Bruins defeated Paul Oosterbaan(Georgia) and Felix Corwin(Minnesota) 7-5, 6-7(13), 10-1 in the final between two unseeded teams. 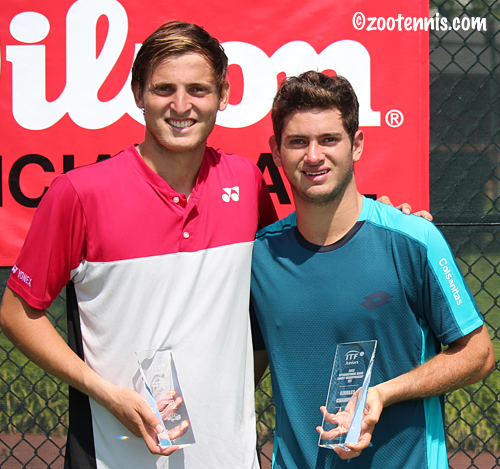 Redlicki has won three other Futures doubles titles with former teammates Karue Sell and Mackenzie McDonald; Zhu has one other Futures title, with Finland's Harri Heliovaara. Zhu beat partner Redlicki in the second round singles earlier in the week and also took out No. 4 seed and 2015 NCAA singles champion Ryan Shane. 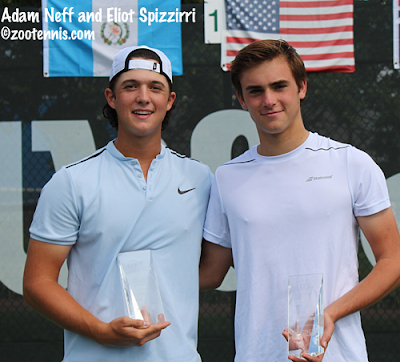 My account of Jenson Brooksby's Kalamazoo 18s championship is available now at the Tennis Recruiting Network. Short videos of the two finalists are available below. A replay of my streaming of the complete championship match can be found here. 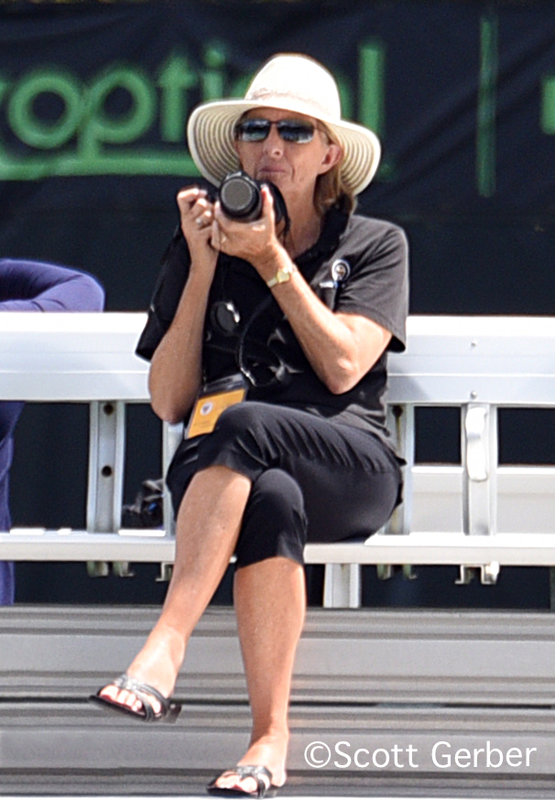 I will be covering, for the fifth year, the ITF Grade 1 International Hard Court Championships next week at the Junior Tennis Champions Center in College Park, Maryland. Qualifying begins on Saturday, with main draw action starting at two sites on Monday. The order of play for Saturday is available here. At the WTA Premier Connecticut Open qualifying, USTA National 18s Champion Whitney Osuigwe won her first match, beating fellow US wild card Asia Muhammad 6-3, 6-3. (Read the Tennis Recruiting Network's recap of Osuigwe's two titles in San Diego here). She will face Belinda Bencic of Switzerland in Saturday's second round of qualifying. Sonya Kenin is the only other American to win a first round qualifying match today. The Tennis Australia women's wild card into the US Open is being decided by a eight-player tournament at the Connecticut Open this weekend. Ellen Perez, the former Georgia star, won not only her first round qualifying match today, but her first match in the wild card playoff, giving her two matches again on Saturday. Vanderbilt graduate Astra Sharma is also through to the semifinals. For today's results, see the Tennis Australia tweet below.